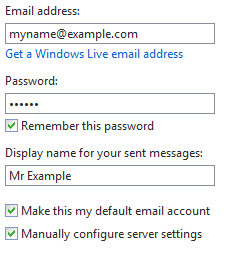 Enter your email address, password and your name then tick the “Manually configure server settings” box. Click Next. In the Incoming Server Information section, choose “POP” as the Server type and enter your email server address in the server address box. 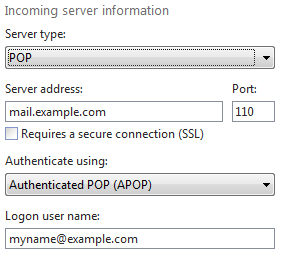 Under “Authenticate using”, choose “Authenticated POP (APOP)” and enter your email address into the Logon user name box. In the Outgoing Server Information section, enter your email server address in the server address box. Change the “Port” number to 587 and tick the “Requires authentication” box. Click Next followed by Finish.